This chapter, “The Subject-Text and its Genre,” first introduces the subject-text—the Kitāb Ikhtilāf al-ʿIrāqiyyayn / ʿIrāqiyyīn—and its layers of juridical disagreement (Sect. 3.1). It then deals with questions of authenticity for both the Shaybānī and Umm versions of the subject-text, presenting the “traditional status quo” of transmission, more recent arguments asserting a later compilation date, and a refutation of the latter (Sect. 3.2). 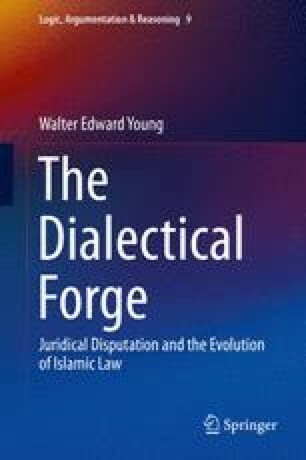 It then explores the history and character of the genres of juridical disagreement (khilāf / ikhtilāf) (Sect. 3.3), exposing how they intertwine with the sciences of uṣūl al-fiqh and jadal. In particular, the relevant structures and contents of two key texts are examined: the aims and organizing principles of the Ta’sīs al-Naẓar (Sect. 3.4), and the legal theoretical and dialectical “premise-principles” of the Uṣūl al-Karkhī (Sect. 3.5).